I was browsing Twitter today and something about Britney Spears caught my eye. I ended up clicking through to an article about her abs. Her abs actually didn’t look that great to me, but then again I have high ab-standards 0:). 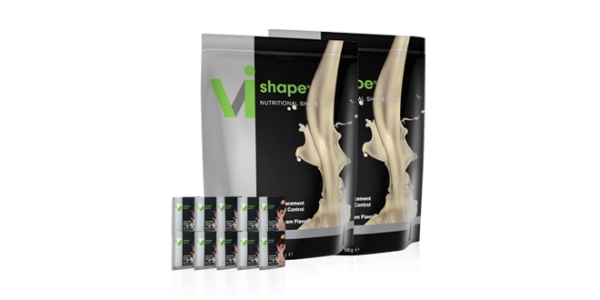 The article went on to talk about how fit and dedicated she is and goes to the gym everyday blah blah, but then it said she takes a special protein supplement called Vi-Shape by Visalus. I had never heard of this company before so I decided to do a little research. After punching in my credit card number, I had a pouch of the vanilla flavor headed my way. I tried not to read too much about the product before-hand because I didn’t want to cloud my judgement of the flavor prematurely. Speaking of flavor, how does Visalus taste? When my package came a few days later, I eagerly ripped off the top tape and dug into the bag. After a little digging in the sand, I came up with the scooper, which was a little bit smaller than I was expecting from a protein supplement. I flipped over the bag and saw that the serving size is actually two rounded scoops- a curious move by Visalus. I made two batches of the shake- one just straight into my Blender Bottle with about twelve ounces of water. The second one, I put into my blender with some whole milk and some ice cubes. I only used about 6 oz of milk because I wanted this one to be a little thicker and more like a milkshake. Shake/Milk Version: I couldn’t help myself so I had to try the good version first. And the flavor was really quite good. The vanilla was pretty strong and complemented the creaminess of the milk nicely. I could drink this pretty consistently. Or so I thought. Much to my dismay, I got that good ‘ole SOY aftertaste. As you know from reading my other reviews, I am not a fan of soy in general. It makes my stomach feel horrid. More on the ingredients later. Water Version: The water version was obviously not as good as the milk version. It was actually quite a bit below par in my opinion. Something about not having the milk there to add some REAL sweetness really brought out the artificial taste of the artificial sweeteners in this product. The soy taste was also much more pronounced when mixed with just water. I would not drink this consistently, no way. I’m giving Visalus a ‘C’ on their ingredients because it’s just not a very good formula. I mean, just look at the supp facts for starters. Two scoops is a stout 26 grams of powder- of which we’re only getting TWELVE grams of protein. Double-U. Tee. Eff. Kind of makes you wonder what the other half of the powder is doesn’t it? Doesn’t take a detective to solve this mystery. Look at the ingredients, which are/should be always listed with those that make up the greatest percentage of the formula at the top. Keeping that in mind you see Soy Protein as number one- which is disgusting because soy is literally horrible for you. And cheap. Ok so we’re getting a soy protein shake, what else is in here that accounts for the rest of the product? Maltodextrin. Surprise Surprise. AKA filler. That’s why I hate this product and can’t give it anything higher than a C- in this review. It’s a friggin soy protein shake with half of it being filler! Total bull. I can’t believe Britney takes this crap! Ok let’s try and calm down a little. Other than soy and maltodextrin, there actually does appear to be some whey in here. By my calculations, I put it at around 3 grams or less per serving. And that’s being optimistic. Next on the list is the artificial and natural flavors (see how I switch them). After that you’ve got all your vitamins and minerals, and some other emulsifiers and stuff. I don’t much care for the vitamin-fest anymore because I actually eat my fruits and veggies. (Wow get off your high horse today Allie). So. The ingredients are pretty lousy, the taste isn’t great, can the packaging be a light in the darkness? I give Visalus average marks on the packaging. The best part is calling the vanilla ‘sweet cream flavor’ which is a tasty sounding name. The second best part is the nice flowing stream of creamy white shake pouring down the front. Pause for effect. LOL. Ah. But seriously. The packaging is pretty decent graphically. The logo is way too 2011 with that stupid origami look, but other than that, it’s a successful package design. My problem is actually with the pouch thing itself. It looks (and is) cheaper than traditional plastic tubs, and makes you feel like you aren’t getting your money’s worth to be honest. The darn thing also like does not close which is super awesome (think zip-lock). And on top of that, you’ve always got powder running up your hand and wrist from shoving your hand into the top slit to get more out. It’s just crappy from a user perspective. It’s actually a text-book example of bad product management- cutting a corner and directly adversely impacting user experience and enjoyment of the product. No I’m not a product designer, I just play one on TV. (Or studied it undergrad LOL). Visalus protein gets a C minus from me on this review because I just plain old don’t think this is a good product. It’s essentially a rip off to spend almost $50 on a soy protein powder that doesn’t even give you 15g of protein per serving! It’s madness. Especiallly when you consider that there are such better options out there. Practically any old whey protein concentrate is going to get you close to 20g of protein at WELL under $2/serving. And it will do your body so much better than this soy/maltodextrin junk. I’m not going to hate on Britney, but she really knows nothing about supplements. This protein powder is brutal and I forbid you from buying it.